GM said the CarbonPro bed — which replaces the standard inner steel panels and floor with carbon fiber — saves 60 pounds. DETROIT — Engineers struggle for each ounce of weight they cut from a vehicle. To get a pound out is a major accomplishment. To lose 60 pounds with one component is a moonshot. General Motors is ready to launch its industry first carbon fiber bed on the GMC Sierra pickup. GM said Thursday that the CarbonPro bed — which replaces the standard inner steel panels and floor with carbon fiber — saves 60 pounds. It is also dent, scratch and corrosion resistant. GM claims it is stronger and more durable than steel. The optional CarbonPro bed is scheduled to arrive in limited volume at dealerships in June on the Sierra Denali 1500 and the Sierra AT4 1500 models. GM is ramping up production slowly and expects to have greater availability of the innovative bed in the 2020 model year. Some of the weight savings comes from parts that were eliminated. For instance, the carbon fiber bed does away with the metal wheelhouse liners used on trucks with steel beds. Also, most truck buyers opt for spray-in bedliners to protect the painted steel bed from dents and rust. That, also, is no longer needed. Another advantage of the carbon fiber bed: because it can be more closely formed to the inner contours of the bed's steel outer structure, cargo room has been increased by a cubic foot, GM says. But all this comes at a cost. Carbon fiber is expensive and time consuming to manufacture. GM has not yet released the price, but it likely won't be an inexpensive option. "The bed is the working end of a truck. It's what brings buyers to the segment," Tim Herrick, GM's executive chief engineer, full-size trucks, said in a statement. 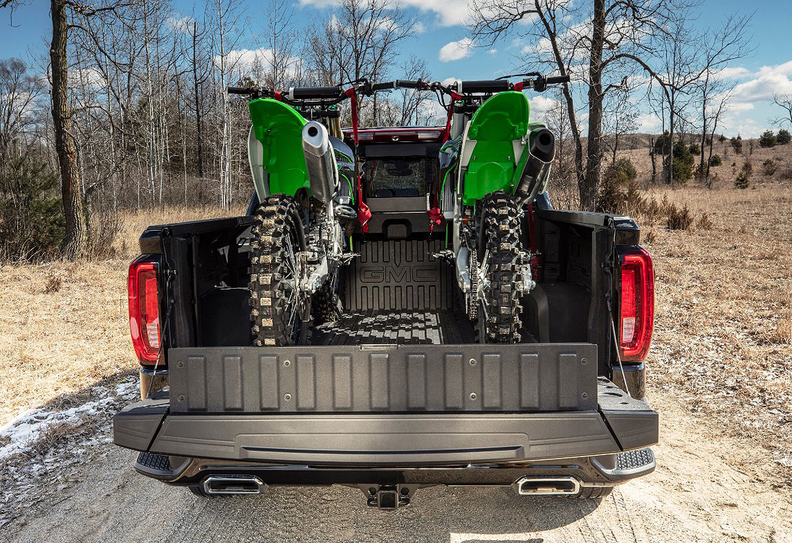 "Loaded with motorcycles, snowmobiles or dirt bikes, CarbonPro in the 2019 GMC Sierra is sure to impress with its strength, space and innovation."